Erbil, Kurdistan Region, Iraq (cabinet.gov.krd) – Kurdistan Regional Government Prime Minister Nechirvan Barzani yesterday received Japan’s Ambassador to Iraq, Mr. Fumio Iwai and his accompanied delegation. Mr. Fumio Iwai announced his government’s intention to open a Consulate General in Erbil in the near future. He also reiterated his country’s commitment to continue providing humanitarian assistance and implement aid programmes in Iraq and Kurdistan Region. The recent political tensions in Iraq and KRG’s economic reform measures were among issues discussed in the meeting. Prime Minister Barzani stated that his government is actively conducting economic reforms and for that it needs international expertise and assistance. 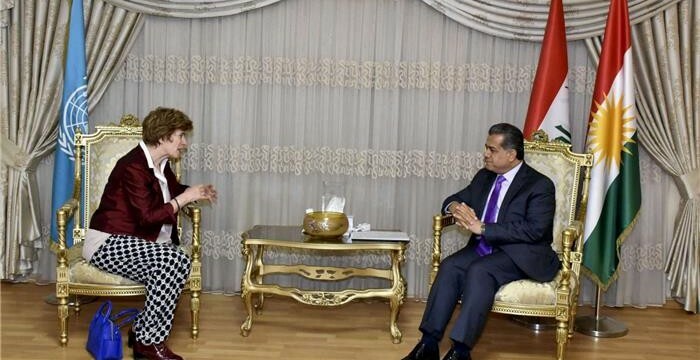 Erbil, Kurdistan Region (dfr.gov.krd) – Head of KRG Foreign Relations Minister Falah Mustafa yesterday met with United Nations Deputy High Commissioner for Human Rights, Ms. Kate Gilmore. Deputy High Commissioner Gilmore praised the role of Kurdistan Region in protecting members of ethnic and religious minorities fleeing ISIS brutality and highlighted the degree of religious tolerance and peaceful coexistence in the region. She said that the UN would continue supporting Kurdistan in coping with such a large number of displaced people and refugees and in documenting the crimes committed against Ezidis and other ethnic and religious minorities. Minister Mustafa thanked the Deputy High Commissioner for her statements of support and stressed that the KRG would continue cooperation with all UN agencies based in Kurdistan. Erbil, Kurdistan Region, Iraq (cabinet.gov.krd) – Kurdistan Region Deputy Prime Minister, Qubad Talabani stated that the US government will continue supporting the Kurdistan Region. In a press briefing to the media yesterday, both Deputy Prime Minister Talabani and Karim Sinjari, Minister of Interior and acting Minister of Peshmerga Affairs, highlighted the outcome of the Kurdistan Regional Government delegation’s visit, headed by Mr Talabani, to Washington. Deputy Prime Minister Talabani stated that the meetings with the US officials covered four main areas, which included the war against the Islamic State terrorist organisation, ISIS, the financial crises which Kurdistan Region currently faces, the issue of a large number of refugees and internally displaced persons who took refuge in Kurdistan, and the relations between Erbil and Baghdad. During the conference, which was also attended by Safeen Dizayee, KRG Spokesperson, Minister Sinjari noted that the KRG delegation to Washington requested financial and military aid for the Peshmerga forces. Deputy Prime Minister Talabani and Minister Sinjari stressed that the United States has reaffirmed its support to the Kurdistan Region. Regarding the recent political problems in Baghdad, Deputy Prime Minister Talabani said that Washington values Kurdish lawmakers and politicians stance by taking an impartial attitude in the current political crisis in Baghdad. Erbil, Kurdistan Region, Iraq (cabinet.gov.krd) – Kurdistan Regional Government Prime Minister Nechirvan Barzani yesterday attended the launch ceremony for Erbil Governorate’s Provincial Development Strategy plan, which was held at Erbil’s historic citadel. Please allow me to welcome Ms. Kate Gilmore, United Nations Deputy High Commissioner for Human Rights, Ms. Lisa Grande, Deputy Special Representative of the United Nations Assistance Mission for Iraq , Belgian Ambassador, Lebanese embassy’s Charge d’affairs to Iraq, and representatives of foreign countries and international organizations in Kurdistan Region. I am pleased to be here with you all, in this spring evening .In an important event for Erbil population, for all its components nationalities and religions, for the announcement of 2016-2018 strategic plan for development of Erbil governorate. I hope that the implementation of the strategic development plan will be completed within its timeframe so that Erbil will reach a higher level of prosperity and development, a level that will be in line with the rich history and culture of this ancient city. The Kurdistan Regional Government (KRG) had previously announced the 2020 regional development strategy for the Kurdistan Region, It articulates the Kurdistan Regional Government’s vision for the Kurdistan Region development and advancement to 2020. The regional plan was prepared in consultation with international experts and is divided into several stages. The plan that we are announcing today is within the framework of the KRG’s 2020 regional plan. The government’s plan is very comprehensive; it takes into consideration the priorities of different stages so that we can bring about further development in sectors that are needed most. Although the fight against terror and financial crisis, and their outputs, have hindered the implementation of the plan, but, with the help of our friends in the international community the KRG is determined to continue the implementation of the regional development plan. Despite all the difficulties facing our region, we are making concerted efforts to further develop Kurdistan and human being in this country. The will and determination of our people to build a better future is stronger than any challenges and difficulties. I hope the same like this announcement ceremony, that is going on right now in Erbil in its scheduled time, to develop similar plans for all cities and governorates of Kurdistan Region. Right now we are in one of the oldest and most ancient sites in the world. For more than 6,000 years that life goes on here, which makes it the oldest continuously inhabited place in the world. This citadel was the first stage of life commencement in Erbil. The citadel has seen different stages throughout its history; it has been the home of many different religions and civilizations, and a place of religious tolerance and peaceful coexistence. The life style, the urban culture and the culture of tolerance and coexistence went beyond the boundaries of the fortress and had a positive impact on the way of life in the entire city of Erbil, because the citadel was the home of the elite, civilized and educated ones and advanced classes, that is why it has left the impact over the whole city, and the spread out of this culture to every where. This culture was the mystery and the main reason that life never stopped inside the citadel. Its because of this culture the citadel has become the symbol of Erbil locally and internationally. In addition to being known for its culture of tolerance and coexistence, the decision of UNESCO World Heritage Center in mid 2014 to list Erbil as a world heritage site ,as the one of the global humanitarian landmarks, turned the citadel into a unique regional and middle eastern historical site. That was a great achievement for the people of Kurdistan Region in general and the people of Erbil in particular. Erbil, as the capital of the Kurdistan Region and as one of the most ancient cities in the world, has a great potential for development. Erbil is a mosaic of different religions and ethnicities and its known for religious tolerance and peaceful coexistence in Kurdistan and Iraq. The developments that Erbil witnessed in different sectors following the fall of the former regime, has turned the city into a regional as well as international hub. Therefore, we need to increase our focus on the implementation of the strategic development plan. We are fully committed to developing all sectors of life in the Kurdistan Region. We have great objectives and we will continue our efforts to achieve them. At some points, due to some unexpected events that are out of our control we might face difficulties in implementing our plans. However, I would like to seize this opportunity to reassure the people of the Kurdistan Region and our friends that we will continue reconstruction process, nation building ,the advancement and the development of country, life and human being in Kurdistan Region. We will do whatever it takes to provide better services for our people. The announcement of the strategic plan for development of Erbil governorate during such a difficult time demonstrates that the will and determination of our people for life , progress, building, reconstruction and for promoting tolerance and coexistence is way more stronger than the will of those fond of war, who try relentlessly, to stop our path to prosperity and growth. A Kurdistan, which was built by the sacrifices of our ancestors from different religious and ethnic groups, is now being protected by the sacrifices of our brave Peshmerga forces, and will never cease its path to development and prosperity. Please allow me to salute the martyrs of Kurdistan and to express my utmost appreciation for the heroic Peshmerga of Kurdistan who are defending the achievements of Kurdistan, universal values, coexistence, and human and humanity against the most brutal terrorist organization. I would like to thank the organizers of this event, the UNDP, the European Union, the Governorate of Erbil, and the High Commission for Erbil Citadel Revitalization for the invitation. I appreciate the efforts made by the Ministry of Planning and Minister Ali Sindi on the strategic plan for development of Erbil governorate. Also special thanks to Governor Mr. Nawzad Hadi for his effective leadership in running the affairs of the Erbil governorate and for playing a crucial role in the development projects of the governorate and all his aides . Today marks the beginning of a New Year-The Red Wednesday -for our Ezidi sisters and brothers. I would like to congratulate them, to pay respect to all Ezidi martyrs and victims, and to assure them that we are continuing our efforts to free all of our Ezidi brothers and sister who are still in ISIS captivity. We are also making concerted efforts to mobilize international support for the recognition of Ezidi genocide. The Kurdistan Regional Government will do its utmost to rebuild their liberated areas . Bratislava, Slovakia (dfr.gov.krd) – On the sidelines of the 11th GLOBSEC conference, the Head of the Department of Foreign Relations, Minister Falah Mustafa held a meeting with Germany’s Minister of Defence, Ms. Ursula von der Leyen to explore ways of tackling the effects of the economic and humanitarian crisis on the Kurdistan Regionas well as the ongoing war with ISIS. During their meeting, Minister Bakir expressed his utmost gratitude to Germany for their continued support of the Peshmerga and the people of Kurdistan. Minister von der Leyen likewise expressed her admiration for the courage of the Kurdish people especially the Peshmerga, adding that she was very impressed by their gains in thefight against ISIS. In regard to the humanitarian dimension of the war, Germany will explore the possibility of opening a rehabilitation center to treat traumatized refugees and IDPs, specifically Ezidi women. There are many women and children who remain severely traumatized as a consequence of the war. Minister von der Leyen added that Germany will furthermore look into the introduction of microfinance programs that would help single mothers in generating a sustainable income. Washington, DC, USA (cabinet.gov.krd) -‘The existential threat to Kurdistan is not a war with ISIS, nor the stress of housing 1.8 million internally displaced Iraqis and Syrian refugees, or even the political turmoil facing the country today. The existential threat facing Kurdistan today is the state of our economy,’ said Deputy Prime Minister of the Kurdistan Regional Government (KRG) Qubad Talabani during a visit to Washington this week. He was speaking to a large audience at the Woodrow Wilson Center, where over 200 experts, government officials, and members of the media had gathered for an event titled, ‘From ISIS to Declining Oil Prices: Qubad Talabani on the Kurdistan Regional Government’s Challenges’. The Deputy Prime Minister was joined in Washington by a delegation of KRG officials including Minister of the Interior and Peshmerga Affairs Karim Sinjari, Head of the Department of Foreign Relations Minister Falah Mustafa Bakir, and KRG Representative to the United States Bayan Sami Abdul Rahman. The purpose of the delegation was to convey the severity of the financial crisis and need for immediate assistance to US administration officials, members of Congress, and the US media. The delegation met with a number of senior administration and defense officials to discuss the range of challenges current facing the people of Kurdistan. On Friday the delegation met with Deputy Assistant Secretary of State Antony Blinken to discuss a range of issues currently facing the Kurdistan Region. Deputy Prime Minister Talabani highlighted the economic and financial crisis in Kurdistan, emphasizing that the inability to pay frontline Peshmerga soldiers and the 1.4 million employees, pensioners, and disabled people on KRG’s payroll was having tangible effect on the war against ISIS. Deputy Prime Minister Talabani and delegation were at the Pentagon to meet with the Undersecretary of Defense for Policy Christine Wormuth. They thanked the US for providing critical military and air support to Peshmerga forces, emphasizing the importance of the Peshmerga brigades the US is currently training and equipping. They underscored the need for continued weapons, ammunition and equipment support, particularly as the front lines are experiencing shortages of critical materials. At the White House, the delegation met with senior advisors and staff of the National Security Council and Office of the Vice President. They discussed the global strategy to defeat ISIS, highlighting the economic, humanitarian, and military components of the future liberation of Mosul. Throughout the week they conducted a number of additional meetings with officials from the State Department, Treasury Department, and Pentagon. The delegation also held several meetings with top officials from international financial institutions the World Bank Group and the International Monetary Fund to discuss the need for emergency financial support for the KRG. With tens of thousands of Peshmerga troops stationed along a 650-mile front line against ISIS and displaced people from Iraq and Syria accounting for a 30% increase in population, the KRG’s operating expenses have exploded dramatically. Compounded by a crash in oil prices, the KRG has been left with a $100 million per month deficit, even after austerity measures cut this figure down from $400 million per month. Throughout the week, the Deputy Prime Minster and delegation had met with a number of leading members of Congress from key Congressional committees. Following their meetings, on Thursday US Representatives Ileana Ros-Lehtinen and Brad Sherman introduced House Resolution 682 urging the State Department to provide necessary equipment and training to the men and women of the Peshmerga. Earlier in the week, all members of the delegation addressed a diverse audience of Middle East experts and members of different ethnic and religious communities at a symposium on coexistence, tolerance and stability hosted by the Institute for Global Engagement and KRG Representation in the United States. Deputy Prime Minister Qubad Talabani said, ‘The KRG needs support from the global community to continue to provide a safehaven for religious and ethnic minorities, and to help stop the cycle of violence and extremism that has plagued Iraq for years. Minister Bakir said, ‘”Inclusive education is key to the reconstruction and stability in Iraq.’ He added that, ‘There is no future in Iraq for anyone if they seek revenge and not reconciliation’. Representative Abdul Rahman said, ‘In 1991, Operation Provide Comfort was tremendously successful in preventing the deaths of some 2 million Kurds who had fled Saddam. Today, the crisis caused by ISIS requires a similar response. At a hotel in Fairfax over the weekend, Virginia, Deputy Prime Minister Talabani briefed members of the Kurdish-American community on the current situation inside Kurdistan and the outcomes of his trip to Washington. Erbil, Kurdistan Region of Iraq, (presidency.krd) – President Masoud Barzani yesterday received a United States government delegation headed by General Joseph Votel, the Commander of the United States Central Command. The meeting was attended by a number of United States military personnel as well as the United States ambassador to Iraq. Accompanying the President were a number of military officials from the Kurdistan Region as well the Prime Minister of the Kurdistan Regional Government and the Chancellor of the Kurdistan Region Security Council. The meeting discussed the current political turmoil in Baghdad and both sides agreed that there needs to be a speedy solution to the crisis as that crisis has a negative effect on the ongoing war against the terrorists of the Islamic State. President Barzani expressed his appreciation on behalf of the people of the Kurdistan Region to the United States and other allies for their military support against the terrorists. On his part General Votel expressed his satisfaction and appreciation for the cooperation and professionalism of the Peshmerga forces. President Barzani and General Votel also discussed the anticipated liberation of Mosul from the terrorists of the Islamic State and stressed that the presence of the terrorists in Mosul, one of Iraq’s largest cities, delays all other progress in Iraq. President Barzani reiterated his position regarding the need for planning post liberation management of the City of Mosul stressing that this step is of equal importance to the military operation to liberate the city. Erbil, Kurdistan Region, Iraq (cabinet.gov.krd) – Prime Minister Nechirvan Barzani yesterday received France’s Defence Minister Jean-Yves Le Drian and his accompanying delegation. Acknowledging that France faced the same enemy, Minister Le Drian reaffirmed France’s support to the Peshmerga Forces, praising their role in the war against the Islamic State terrorist organisation, ISIS. Prime Minister Barzani and Minister Le Drian discussed the latest developments in the Kurdistan Region and Iraq and the war against ISIS, including the anticipated liberation of the City of Mosul. They agreed on the significance of the liberation of Mosul and that coordination among Peshmerga, Iraqi army, and coalition forces was vital in this operation. Prime Minister Barzani stressed that the plan must clearly define the roles of each of the participating forces. They also discussed the military and financial needs of the Peshmerga Forces. Prime Minister Barzani stressed the need for the Federal Government of Iraq to provide military and financial aid to the Peshmerga. He called on France to help ensure that Iraqi Kurdistan receives its full share of international military assistance in a timely manner. Minister Le Drian promised to convey this request to French President Francois Hollande and international partners. He also stated that in June another batch of French military aid will be delivered to Iraqi Kurdistan. The Kurdistan Regional Government’s efforts to obtain financial aid, the plight of refugees and internally displaced persons, the need for Iraqi and international humanitarian aid, relations between Erbil and Baghdad, Iraqi Kurdistan’s relations with neighboring countries, and a number of other issues of common concern were also discussed. Erbil, Kurdistan Region, Iraq (cabinet.gov.krd) – On a one day visit to Istanbul, a Kurdistan Regional Government senior delegation headed by Prime Minister Nechirvan Barzani, yesterday met separately with President of the Republic of Turkey Recep Tayyip Erdogan and Prime Minister Ahmet Davutoglu. They discussed the latest developments in the Kurdistan Region and Iraq and the war against ISIS, as well as the anticipated liberation of the City of Mosul. On economy and trade, they also discussed bilateral relations between the Kurdistan Region and Turkey, ways to ease the financial crisis in the Kurdistan Region, and the formation of Iraq’s new cabinet. The Turkish President and Prime Minister stressed the need for all the Iraqi parties to reach agreement and settle the differences through dialogue and mutual understanding. With regard to the liberation of the City of Mosul, they deemed it necessary that the international coalition, the Iraqi army, the Peshmerga, and the people of the City of Mosul constitute the participating forces in the operations. Within the framework of the Kurdistan Region’s continuing efforts to develop and strengthen its relations with neighbouring countries, Prime Minister Barzani stressed the importance of relations between the Kurdistan Region and Turkey. He expressed his hope that all Iraqi parties will unite their efforts in order to be able to address the financial crisis and eliminate the Islamic State terrorist organisation. Erbil, Kurdistan Region, Iraq (cabinet.gov.krd) – A high-level Kurdistan Regional Government delegation yesterday held a series of meetings with senior US and Iraqi officials in Baghdad. The delegation, which was led by Prime Minister Nechirvan Barzani, and included Deputy Prime Minister, Qubad Talabani, Kurdistan Region President’s Chief of Staff Dr. Fuad Hussein and KRG Spokesperson Safeen Dizayee met the US Secretary of State John Kerry and Ambassador Stuart Jones. In the meeting, held at the US embassy in Baghdad, Kurdish and American officials reaffirmed their commitment to further improve bilateral ties. Mr. Kerry reiterated his administration’s support to Iraq and Kurdistan Region in the fight against terrorism and dealing with financial challenges. The KRG delegation also met senior Iraqi officials, including President Fuad Masoum and Prime Minister Haider Al-Abadi. In both meetings, Kurdish and Iraqi leaders stressed the need for further cooperation between Erbil and Baghdad to deal with mutual challenges. The KRG delegation also met Ammar Al-Hakim, the head of Islamic Supreme Council of Iraq.